The issue opens and while we get some Batman narration, we see a stand-up comedian trying out for a job...I guess. It's a very cold open and since the narration immediately feels important, it kind of takes away from the scene going on behind it. I don't know how some will take it, but when Batman said he didn't understand what happened so "All I can do is tell the story", it threw me off a bit. I guess I am waiting for Batman to be in control of something in this run of his. We then shuffle off to visit with the Riddler and get a time frame of the story (about a year after Zero Year stuff) and a cool bit where the GCPD goes to him to help solve cases. He seems to be playing a game with the Detective until Batman is brought up and then the Riddler changes his tune and wants to help. Unfortunately for the police officer (who seems to have gotten a big promotion in the past five minutes because he is now a Lieutenant), this change of heart proves to be deadly as Nigma stabs him 26 times...once for each letter of the alphabet, "to show that he had something to say". I want to stop here for a second because this is what's been driving me insane with King's run on Batman so far. This scene is pretty cool on paper, but doesn't pass the sniff test. How did Riddler sneak this shank in with him? Where are the other guards? Why doesn't anyone come in to help. He stabbed him 26 times! That takes a bit of time, right? 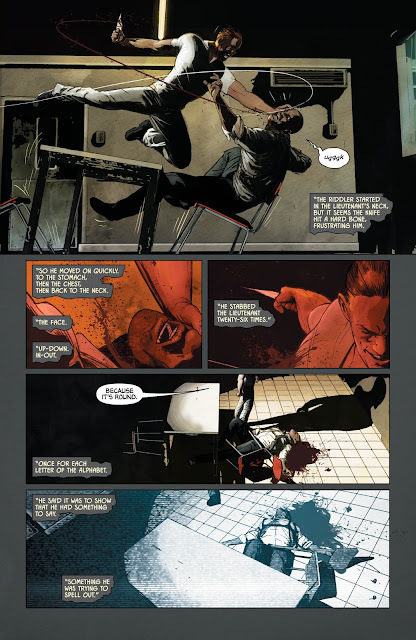 Stab the air 26 times right now and you will see how long it takes and that is just you stabbing air with nobody fighting back or changing locations like the Riddler supposedly did. Just another bit of nonsense to set up a "wow" moment. We then head off to see Jim Gordon and the GCPD raid the Joke Factory and after the beginning scene, you know this is the Joker! There is an explosion which proves to be a diversion as the Joker shoots a cop and a woman and walks away, reminiscent of Heath Ledger. The Joker! This should big, right? It probably would have been if we didn't just see the Joker in The Forge a week earlier (whether or not that was this Joker, wink wink). I won't go nuts that the Joker seemed to shoot the two without anyone noticing though he fired his gun close to other officers...we will pretend the fire was distracting them. Back to the Riddler, he just walks out of prison because he knows the guards families names and ends up face to face with the Joker. It seems the Nigma has figured out the Joker's problem and it's all tied to what's been bothering him as well...Batman. Of course it's Batman! I do like the explanation of it all and really like these two going up against each other after this little scene. 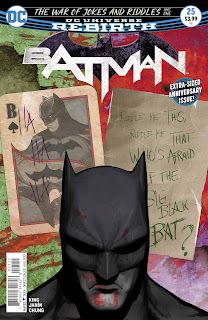 The issue then ends with the Riddler with a bit of a bleeding problem, the Joker on the loose and Batman telling his best girl that she better listen up because he's got quite a story to tell...one that nobody knows. For how much I was looking forward to the War of Jokes and Riddles to start, this issue was not the start I imagined. It was slow to the point of being a bit boring and pretty thin in the actual story department. 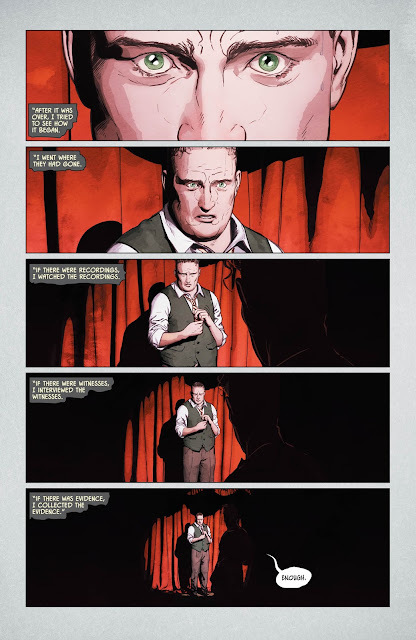 Tom King continues to throw scenes together for effect, but without thinking through the reality of what's going on on the page and that is really getting frustrating since it happens over and over and over again. I loved seeing the Riddler and Joker again, but even they seemed off with jokes and riddles my ten year old would laugh at. Maybe King was trying to show them at their beginnings, but "because 7 8 9"?!?!? Really?!?!? 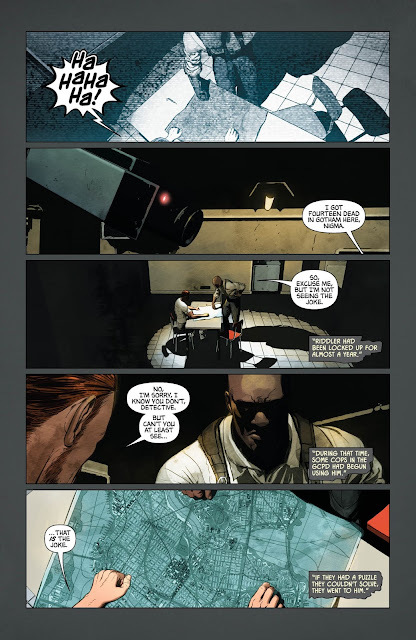 I loved Mikel Janin's art and that's no surprise because I always do. His Riddler is about the sexiest version I've ever seen of him and I loved it. His Joker was good as well and everything in between looked great. 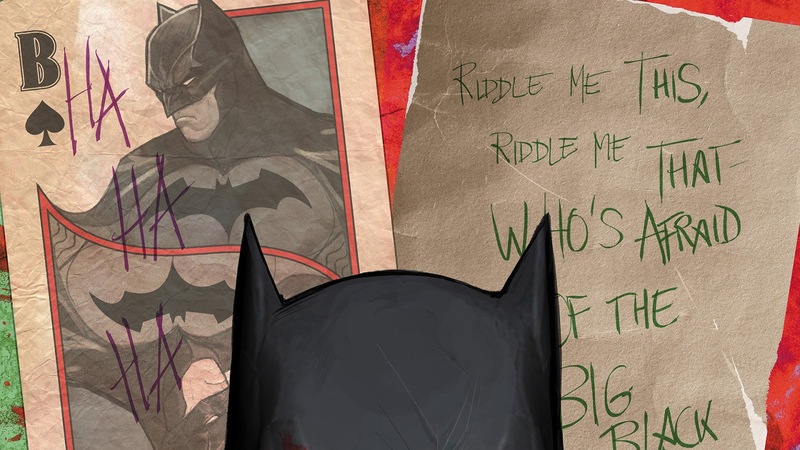 This is a slower start to the War of Jokes and Riddles than I expected and a big letdown. It's obvious that Tom King is going to take his time here (it is a very long story), but I need something to grab me in each issue and this one doesn't have much to hold onto. I did love Mikel Janin's art, but even that wasn't enough to recommend this issue. I'm with you on all of your complaints, including having one of my own involving the security guard that helped Riddler, but I think the scope and idea of it won me over quite a bit because I enjoyed this issue a little more. I like this Joker as he reminds me a bit of Burton's Joker in a way. Did you Joker shoot two cops right in front of other cops and just walk away? that doesn't even make sense...so if you don't like a movie I'll just wait until you make one??? If you don't like a certain food, I'll wait until you make one? I am not sure that you know what a review is!!!! But wait the man at the comic shop said we were going to get a conclusion for issue 24. Oh jeez, I guess we will have to wait for a break in this arc for that follow up. I liked this issue quite a bit. First of all, Janin's art is great; that's almost a given. And I do have a problem with Nigma getting the time to stab the lieutenant 26 times (the refs and/or linesmen usually step in and stop that kind of thing), or the Joker shooting the cop and the woman and just walking away (the refs and/or linesmen usually step in and stop that kind of thing). But I enjoyed this portrayal of the Joker more than anything we've seen since pre-New 52. This Joker actually seems crazy, as opposed to Snyder's "really violent guy who makes well-thought-out elaborate plans -- and, oh yeah, he's also immortal." And I enjoy a bit of character development and exposition while setting up a story. Overall, I had a good time reading it, and I give it an 8 out of 10. And I'm looking forward to the next issue, hoping it will improve and pick up the action. I don't think we got any characterization with the joker...we saw him become joker in zero year and now it's a year later and I can't tell what he's done or what he is all about...just that he can't laugh. You have a very valid point about where did Riddler get the knife and where were the guards to monitor the interview . The rest worked for me but I will definitely admit when you are right .